NAFTALAN, AZERBAIJAN. 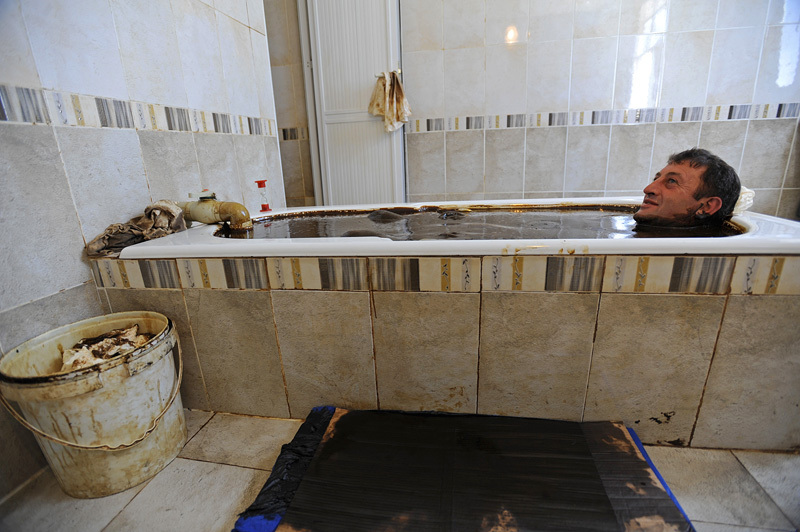 Quliyev Jeyyub from Tartar, Karabakh in the disputed once Azerbaijani territory now occupied by Armenia, sits in an oil bath at the Sehirli Naftalan Health Center and Hotel on July 19, 2010. Naftalan is famous for its oil bath treatments across the former Soviet Union and several such treatment centers exist in the town; patients are only allowed to bath for 10 minutes before having oil scraped from their bodies by a nurse attendant and showering.